Richard watches in horror as the small robot with the chainsaw arms approaches Robo, the teeth of the chainsaw starting to spin rapidly. But the robot reaches past Robo and picks up a piece of metal near Robo's head. The robot's diamond-tipped blades slice through the metal with ease, and the machine then turns around and heads back in the direction it came with its prize. Richard quietly asks Robo what that machine was, and Robo answers that it is a metal-collecting machine called a dakom. Unfortunately Robo doesn't lower the volume of his voice and the retreating dakom turns around and finally notices the two newcomers. The dakom suddenly fires a laser at Robo, striking his torso and knocking him on his side. 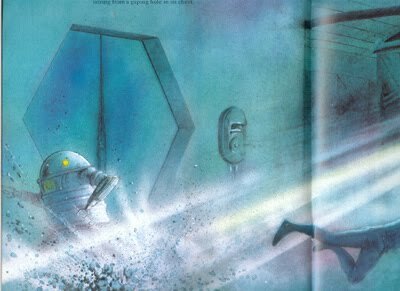 Frantically Richard and Robo turn and flee from the dakom, scrambling over the scrap as the dakom purses them and continues firing its lasers. Richard spots what looks like a service hatch and orders his friend toward it. Just then a much brighter flash of light erupts and when Richard turns he sees that the dakom has been destroyed - Robo had fired his own laser and turned the dakom into scrap. With the dakom out of the way, Richard approaches the hatch and grabs the rusted handles. Robo advises that more dakoms are approaching, which makes Richard tug harder. The service hatch then suddenly pops free and he climbs inside. Robo squeezes inside as well and Richard closes the door. Robo then fires a beam of light at the door. At first thinking it's his laser, Richard quickly realizes that Robo is actually welding the hatch shut to ensure the other dakoms don't get through. With the dakom threat over, Richard gets his bearings in the large room they have just entered. As he does, he becomes aware of a sound inside, signalling that they are not alone within the dark chamber. He looks for the source of the sound and his heart sinks when he sees it. Standing not too far away from them is a menacing figure wielding a giant sword and wearing metallic armor. Robo immediately scans the creature and identifies it as Husasan, silicon samurai. Robo also informs Richard that the samurai, currently standing still, is scanning Richard for possible weaknesses. 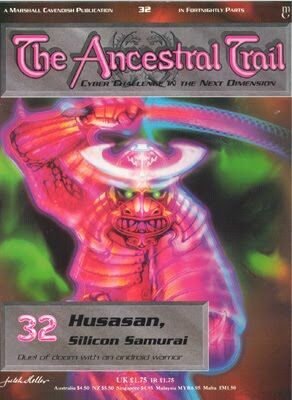 Richard realizes that he is trapped between Husasan and the dakoms, and before he can weigh the lesser of two evils, Husasan charges straight for him. 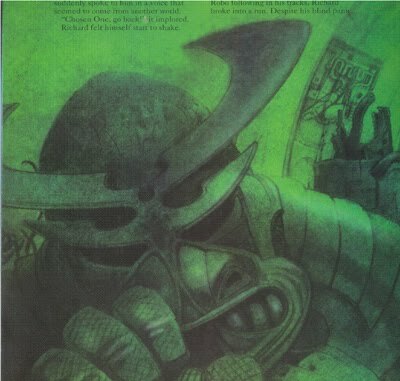 The samurai stands near Richard and swings his massive sword at the Chosen One. Richard tries to dodge, but the force of the wind alone is enough to knock Richard off his feet. In desperation, Richard rolls along the ground to avoid the blade striking him. Husasan's sword misses Richard in a hailstorm of sparks. 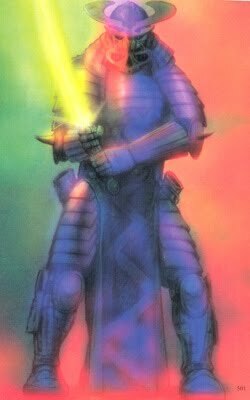 Robo then attemps to attack Husasan by firing his laser, but the laser does no damage to the samurai's armor. Husasan turns his attention to Robo, whose binary panel suddenly outputs a message. Richard quickly translates it, thinks the riddle through, and abruptly realizes the answer. He orders Robo to fire at Husasan's ankle, but Robo is too busy avoiding the samurai's attacks to do so. A forcefield erected by Robo is protecting him from Husasan's blows, but it becomes clear the samurai will get through eventually. Realizing he had to intervene, Richard takes his sword and swings it at Husasan's back. The sword does little more than bounce off the samurai, who turns to Richard further enraged. Richard takes the chance to scan both of Husasan's ankles and spots what he is looking for: what appears to be some kind of switch on Husasan's right ankle. But he has no chance to attack this weak spot as Husasan starts swinging his blade at Richard. Despite blocking each of the samurai's attacks, Richard recognizes Husasan's superior strength. Husasan suddenly uses his gloved hand to slap Richard and send him flying through the air. The Chosen One lands on his back but cannot get up before Husasan looms over him and places a boot over his throat, gleefully gloating over his inferior opponent. But Richard is now closer to his adversary's ankle. As Husasan raises his sword into the air, Richard takes his blade and pushes it hard into the switch on Husasan's heel. The samurai speaks for the first time by screaming in agony. Cracks appear in Husasan's armor as the silicon samurai begins breaking up. 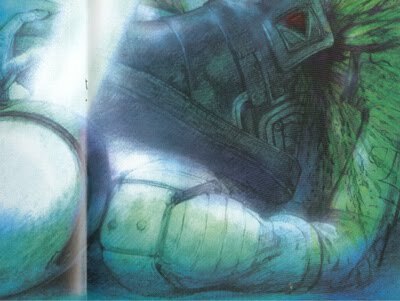 Richard squirms from underneath Husasan's boot and tells Robo to withdraw, though Robo reminds his companion to withdraw his sword from Husasan's heel. 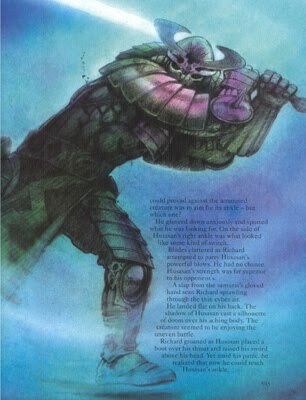 Richard nods and retrieves his blade as the samurai evaporates into an armor shell. As Richard and his friend flee the decaying Husasan, a ghostly voice could be heard from the remains: "Do not enter the library. Danger." Richard asks what Husasan means, but Robo has no sufficient data to properly respond. 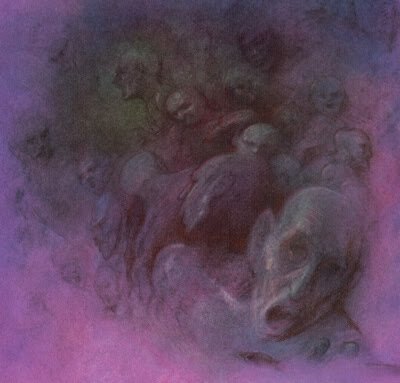 The pair enter a dimly lit tunnel and follow it, noting some foul-smelling green slime. The light grows even dimmer, prompting Richard to ask Robo for some light. 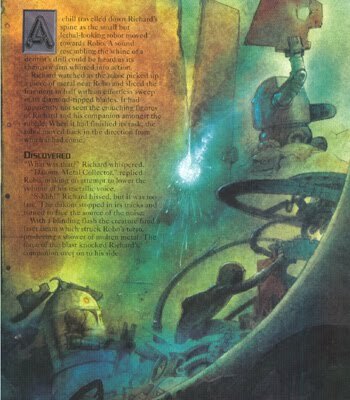 The robot responds by shining a torch from one of its panels. Inside the tunnel, Richard can finally see a series of strange paintings of faces on the well. The paintings are sad and sorrowful and their faces seem to follow Richard as he walks past. Suddenly one face speaks up with an other-worldly voice, pleading for the Chosen One to go back. Richard, shocked, asks the painting who it is. The painting identifies itself as a fragment of light, an echo in time, and again pleas for Richard to turn around. Frightened, Richard instead hurries further down the tunnel. The rest of the paintings come to life and whisper hauntingly to Richard. Eventually the companions reach the end of the tunnel - a pair of metallic doors, which Richard pushes open. Inside, he finds himself ina massive gallery enveloped in blue light. On the walls were hundreds of glissening glass spheres stacks in numerous piles. Robo indicates that they are in the Library that Husasan had warned them about. 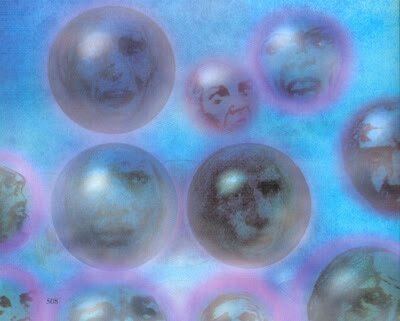 Before Richard could ask for clarification, he hears a sobbing sound and realizes it is coming from the glass spheres. 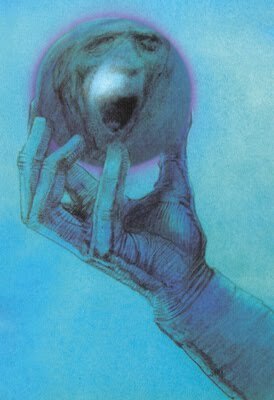 He picks up one of the spheres and is amazed to see a human face inside. The face inside speaks to Richard, asking for help. 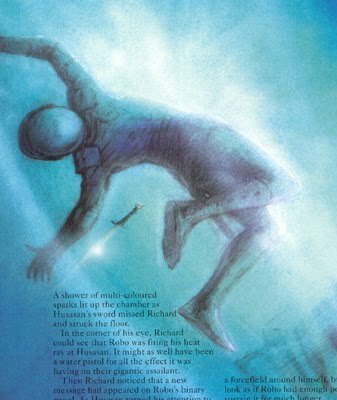 Richard asks what's going on, and the person inside says that he has been trapped for an eternity by Husasan, who uses him and his fellow trapped beings as his energy source. 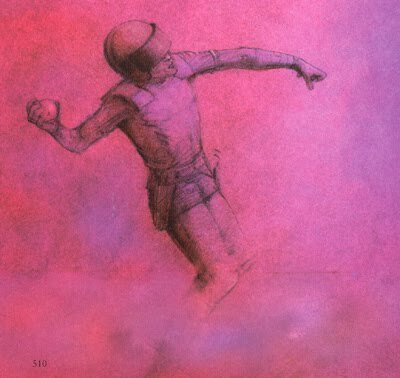 Richard shrugs and throws the ball to the floor, breaking it and releasing a cloud of smoke. From the smoke steps a human-like figure in the form of a small beautiful child clad in white. The boy introuces himself as Peter in an angelic voice. He informs Richard that he and his friends are floating beings that existed before the Big Bang, and that Husasan has been using them to fuel his power since the beginning of time. Peter, knowing Richard is the Chosen One, pleas for him to break the rest of the spheres. A chorus of cries erupts from the other spheres as they ask Richard to free them as well. Richard obliges and starts smashing the spheres at a fast rate. Smoke fills the room as more human shapes emerge, and they also help freeing all the captives. Within a short while, all of the glass spheres have been broken. Richard begins noticing something is wrong when he realizes the smoke smells of rotten egs. Suddenly, a cruel laughter is heard and Richard knows that somethiing is wrong. The angelic form of Peter suddenly emerges and he scoffs at the Chosen One being a fool. There is a flash of light, and the beautiful Peter is replaced with a far more rotten appearance clad in black. Richard demands to know what is going on, and the new Peter smiles, exposing his rotting teeth. Mentioning the irony of the Chosen One freeing them, Peter informs Richard that they are the remnants of everything evil on the universe, the residue of every cruel act performed in every world and dimension, the echo of everything bad. As thanks for freeing them, Richard will now receive the ultimate reward: becoming one of them. The room fills with smoke once more, and the multitude of figures melt together and congeal into a giant skull-like apparition. The skull orders the Chosen One to approach it. 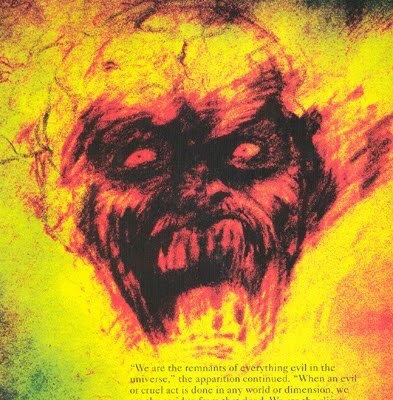 The thirty-second issue of The Ancestral Trail is one of the more interesting issues, in my opinion, and it doesn't have much to do with the monster on the cover, Husasan. It actually has a lot to do with the Atomizers*, the creatures that Richard set free inside the Library. These beings are the remnants of every evil act ever performed in the universe and across all dimensions, and I would love it if there had been some further exploration of these monsters. I also find it interesting that Husasan, who appears to be an evil robot initially, was actually guarding the Atomizers and warned Richard not to approach the Library. Despite his enjoyment in trying to kill Richard, Husasan was performing a noble deed in his guarding of the evil beings. Why was Husasan guarding the Library? Did he really use the Atomizers for fuel, or did he guard the Library solely out of some pre-programmed duty? Another plot-thread left hanging are the paintings inside the narrow corridor before the Library. Who were these paintings, and what was their purpose? Since they warned Richard to go away from the Library, they obviously were not in league with the Atomizers. Could these paintings, like the Atomizers being residue of evil acts, similarly be the resudies of good acts? If so, why did they appear as sad, sorrowful paintings? Finally, an interesting thing to point out about this issue is the front cover artwork of Husasan. In all of the previous issues, the artwork used on the front cover always appeared in some shape or form inside the issue itself. In this case, Husasan's cover portrait appears nowhere inside the issue. In fact, the cover portrait looks noticeably different from the issue artwork (notice how cover Husasan has green eyes, while the issue Husasan doesn't). My guess is that the cover artwork was some kind of temporary or test artwork that ended up not being used inside the issue but was selected as the cover picture because none of the issue artwork really worked for the cover artwork. *The name "Atomizers" comes from the trading card that features these creatures on the face. In the issue, these beings do not have a formal name (and still don't in the next issue), so the card makers had to come up with some kind of name for them. While Atomizers sounds like a peculiar title for creatures considered to be the residue of evil throughout the universe, it will be better explained in the next issue.